Bitsboard is an amazing app that I want to share with all of you because It is one of the most versatile apps I’ve ever seen. So many different people can use it for different things. You start with a collection of boards which is a collection of vocabulary or a category. You can select from premade boards in the app or add your own pictures (I do both). Once you pick which board you want to use, you select what kind of activity you want to do from 23 mini-games. You can do matching games, receptive ID, spelling, and so many more! 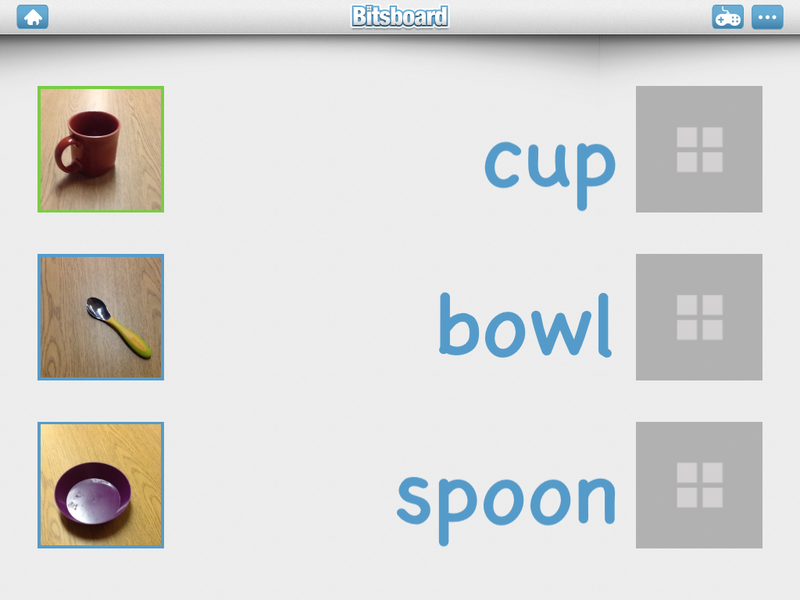 The most amazing part is Bitsboard makes these activities for you. For example, I made a board for a student working on functional vocabulary. I took pictures of items in our kitchen area- a bowl, cup, spoon, etc. and imported them into the app. Now I can use these words in 23 different premade activities. Bitsboard is available for iPhones and iPad. It has a free version and Pro for $14.99. I have the free version and get enough use out of it that I haven’t upgraded yet. Bitsboard comes with so many great activities already built for you. Once you select a board, you pick which game mode you want to play. 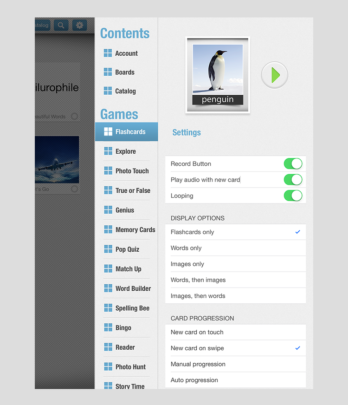 The long list of activities includes flashcards, explore, photo touch, true or false, genius, memory cards, pop quiz, match up, word builder, spelling bee, bingo, unscramble, reader, word search, photo hunt, story time, side by side, odd one out, sort it, word chunks, puzzles, review game, and the trace it game. These games can be used by all different ages and levels of students! It’s great for working on language, vocabulary, spelling, or reading. The premade boards you can download are found under Collections. They offer many different collections of vocabulary including English Vocabulary, Emotions, First 1000 words, Word families, Sight words, and Fry words –which is nice if your classroom is already using one of these types of lists. You can also buy extra boards for purchase: such as grade level spelling from preschool to grade 12, master vocabulary from beginner, intermediate, and advanced, and math terms. The purchase options are a monthly subscription for all of their premium boards for $0.99 or a one year subscription for $9.99. 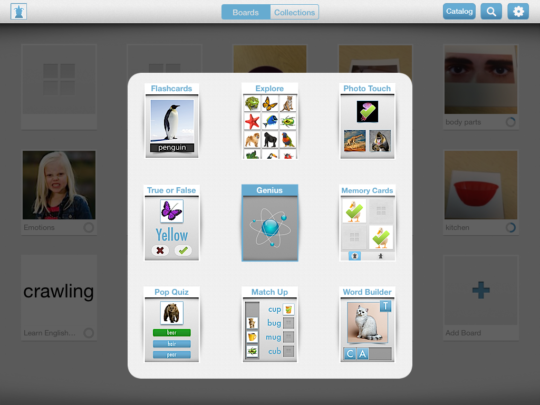 One of the reasons this app is so versatile is because you have many options to customize each board. You can make your own, edit their boards, or import boards from your computer. If you want to make your own board you can import your own pictures or choose from Bitsboard’s gallery. I love that you can really customize each board for your students by editing the settings. When you create multiple users, Bitsboard automatically saves the settings for each game at the user level. This is so useful because one student may use a field of 4 answer choices and another may need a field of two. Some students may read at the word level but some may need pictures. You can really make it fit your child’s needs. At the end of each game a scorecard appears that you can email to parents or teachers. The scorecard shows the percent answered correctly with the option to see how the student has done the past 10 rounds for each game by clicking on “All Time”. 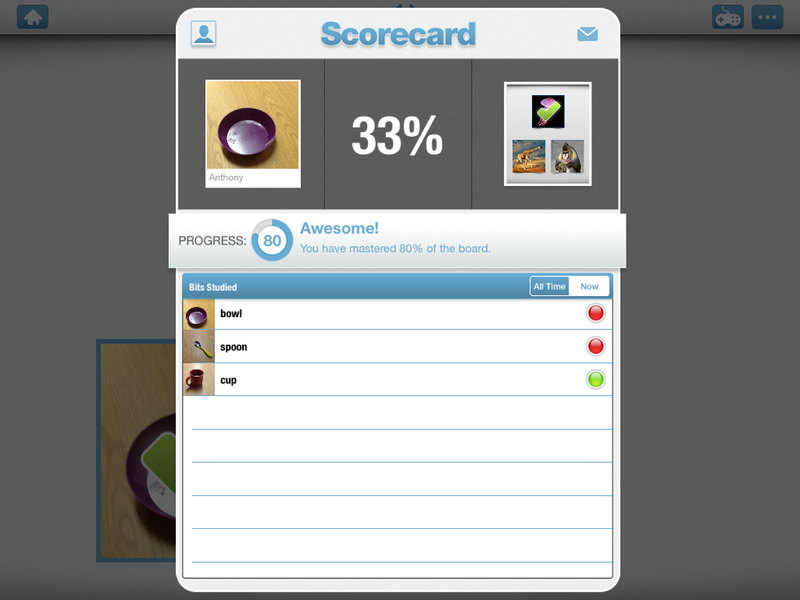 On the home menu you can quickly see how well your student in doing by looking at the progress indicator (the small circle next to the board’s name). The circle is colored in blue to show how well the student in doing. If the circle is completely filled in, that means the student has answered all of the questions correctly the last 3 times they used it. This is a quick way to get progress data! If you are working with younger kiddos you may want to change the scorecard option to have a sticker reward (change in settings). In this option, a visual scene pops up at the end of each game- these are cute little scenes like outer space. The student can drag a sticker onto the screen for a fun and engaging reward. Another great feature is Switch Accessibility support for people who use switch devices to access an iPad. Most of the games in Bitsboard will work with Switch Control except for a couple of games. The games that will not work are games that require gestures (drawing on the screen or drag and drop) including Puzzles, Trace It, and Word Search. Another accessibility feature is increasing contrast to help people with low vision see the screen better. This is a feature you can control in Accessibility Features under the general iPad’s settings. For more on how to use Accessibility Features see our blog The iPad’s Accessibility Features 101: A Quick Start Guide for Special Ed. Everything I’ve described so far has been using the free version. The Pro version offers access to more boards, the ability to import and export boards with Dropbox, and the ability to search the web for pictures within the app. As previously mentioned you can also subscribe for a smaller fee to get more boards. What are your favorite apps? Let us know! Sign up for our mailing list here to stay updated with our latest therapy tips, app announcements, and blog posts. Don’t forget to follow us on Twitter, Pinterest, and like us on Facebook!